This is an oil completed many years ago while in my early learning stages of painting and drawing. Yet, are we ever done learning? Part of my self instruction in the beginning was to copy and this was taken from a published photograph. Therefore, I was never able to use this for exhibition or for sale. I learned a lot by examining the work of others. 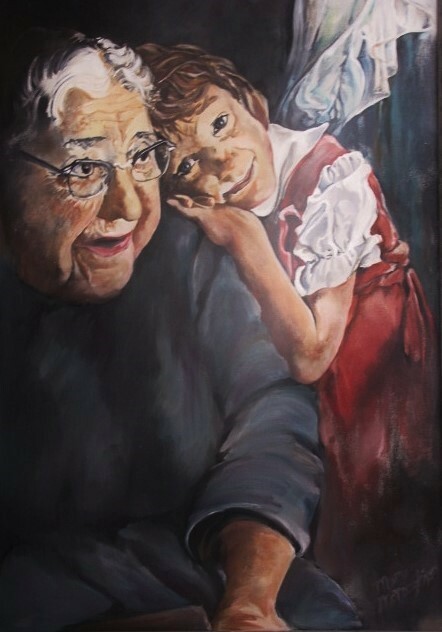 The goal at the time was to try and capture the tender portrayal by the photographer of a grandmother and small girl. I was taken by the dramatic light play across the subjects coming from one source, the window; and the added contrast of the darkened room. While I appreciated the work of the photographer, I began to add touches of my own personality. You are currently reading Borrowing From Others or Imitation is the Best Form of Flattery at Dr. Mary McNaughton and Drawing.